At Majestic, we understand office space. We know that you're looking to lease or rent a hassle free location to grow your business. You want options and we're there to help you make the right decision. We offer tenant services so that you don't need to worry about your space-you can focus on what's important. Not sure what sort of office you need? Contact us for a free evaluation. We offer 3D visualization, floor planning services, construction of leasehold improvements, and much more. Many quality tenants choose to lease space in the HSBC Tower at 299 Victoria Street. It is one of Prince George's premiere office locations. The tower offers heated underground parking, a ground floor coffee shop, free bicycle storage and shower/change room facilities for tenant use. The large 2nd floor patio is perfect for staff BBQs on summer days. Air conditioning, heat, hydro, and janitorial are included in the rent. The state of the art HVAC system offers excellent staff comfort while reducing your carbon footprint. Call 250-562-Rent for more information. The Scotiabank Building at 1488 - 4th Avenue, Prince George, BC features one of the highest ratios of window space to floor area. 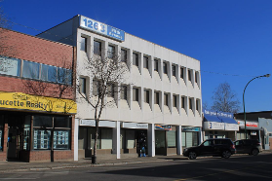 If you are looking for a premier location with lots of natural light, then this building is a must see. Recent upgrades include a new HVAC system and elevator upgrade. Air conditioning, heat, hydro and janitorial are included in the rent. Call 250-562-Rent to see how this might be the right office space for your business to lease. 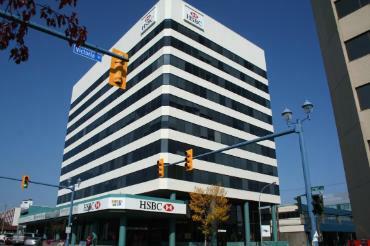 The Royal Bank Building at 550 Victoria Street is in the heart of Prince George's bustling financial district. With easy distance to downtown businesses and great restaurants, you can see why many tenants choose this building. Air conditioning, heat, hydro, and janitorial are included in the rent. Call 250-562-Rent to see which office your business could rent. 2,268 square feet of office or retail space immediately across from the Courthouse and Farmer's Market. Big east facing windows let in lots of natural light without the heat of the day. Suite is air conditioned and can be split. Tenant pays own heat and hydro. Call 250-562-Rent to see it today! Amazing 2nd floor office with skylights! This office has incredible natural light with some offices and some open work areas. 2,295 square feet and newly renovated washrooms. Rare find! 1,980 square feet of office space on the ground floor with lobby access. Building has excellent temperature control and efficient HVAC system. 5,366 square feet is available on the second floor. You can take the whole floor or just a portion. Windows face south and north for good daylight exposure. Exterior signage is available and the building has a proper elevator. Call 250-562-Rent to see how this space can work for you!